The Integrated Systems Europe Show has run since 2004 and has grown to attract over 1100 exhibitors and over 65,000 visitors (ISE 2016). This is due in large part to its "reputation for connecting new technologies, companies and end-user industries." ISE 2017 in Amsterdam continued in this vein and presented an "exciting show floor, featuring thousands of product launches, as well as a packed education and events programme." 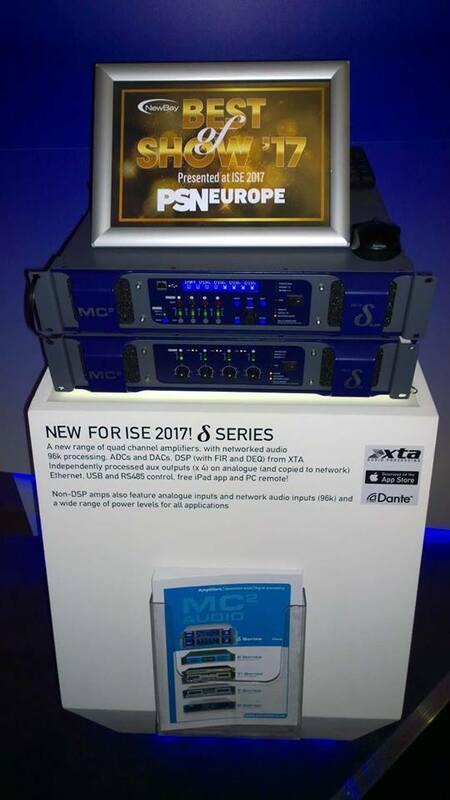 Day three saw the new MC2 Delta Series awarded the Best of Show 2017 for the new Delta Series by PSN Europe! See below for more information on these great new components. The Delta Series includes DSP enabled power amplifiers all featuring 4 additional independently processed auxiliary outputs, with Dante networking (inputs and outputs), and Non-DSP amplifiers at a variety of additional power levels, also available with Dante network inputs. Remote control is via direct Ethernet, USB or RS485, using XTA's AudioCore platform in conjunction with the bespoke DeltaDirect iPad app.